Background: Adnexal masses are a common presenting concern among women of all age groups. While the majority of adnexal masses are benign, the differentiation of a mass and diagnosis of malignancy can present a dilemma. The use of laboratory studies and tumor markers, which can be obtained through minimally invasive means, can aid in the diagnosis of a mass or the decision to refer a patient to a specialist. 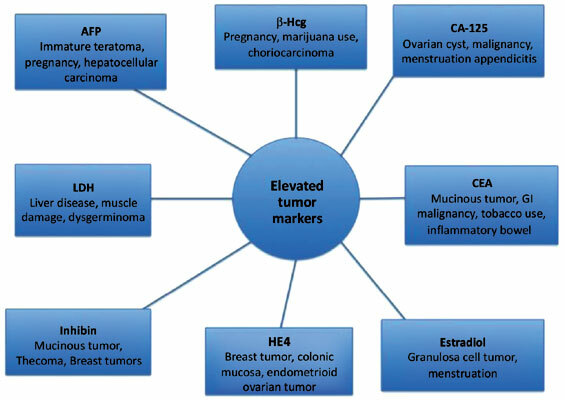 Objective: This review provides information on current available tumor markers, their use in the diagnosis of various adnexal masses and tumors, a review on current biomarker panels, and the role these results play in treating pre- and postmenopausal patients with adnexal masses. Results: Many tumor markers exist; however, the majority of markers are not specific to one tumor or cancer. Many benign conditions also cause elevations in tumor markers, which can make distinguishing benign and malignant conditions difficult. In recent years, the development of biomarker panels has served to improve diagnostic accuracy when dealing with an adnexal mass and algorithms have been developed to aid with triaging a patient to continued observation versus referral to a specialist. Conclusion: It is important to merge clinical and laboratory data together when diagnosing and managing any patient with an adnexal mass given the many benign and malignant conditions that can cause elevations in tumor markers. Adnexal masses, tumor markers, adnexal masses diagnosis, malignancy, postmenopausal patients, cancer antigen.